I’ve a parting gift for you… perhaps it is nothing. But for the sake of our time together, I offer this glimpse through the eye of providence upon the standard pattern Tarot. You may do with it as you will. And for any of you remotely concerned with the 7th wonder of the world, the Great Pyramid at Giza sits at just about 30-degrees north. Which might be nothing more than passing coincidence were it not for the fact that the sum of the 22 major cards of the deck 0+1+2+3+4+5+6+7+8+9+10+11+12+13+14+15+16+17+18+19+ 20+21 = 231, when multiplied by 16 and the fourth power of 10, equals the number of miles comprising the volume of the 30th parallel of earth viewed as a circle. Naturally the argument arises that a standard mile (5280 feet) is but an arbitrary measure of length, one of little significance to such a geometric construction of the Great Pyramid upon the circle of its latitude. Yet it may be worth noting that, for a civilization keen upon measuring the passage of time by starlight, that 5280 feet is also 1 minute of arc along that circle. I’ll leave it to you to reverse engineer the importance of that Fact to an ancient astronomer living in the glory days of Kemet (And, truly, it is a useful exercise for seeing how far we’ve come). Of course, one may reasonably then argue that the foot is an even more arbitrary unit of measure to impose upon the time and place of that civilization when their Mer of Khnum-khufu was erected. But, it turns out their architects were well familiar with that unit, calling it DJSR, or Djoser. Written as an ‘arm holding the power stick’ (or sekhem scepter) in hand, the DJSR of sixteen djeba (fingers) is not only equal to our foot but also depicted in hieroglyph form something of the ritual act of measure itself – the means of delineating an otherwise insensible, chaotic space with the power of numbers by holding a notched stick. A power capable of building temples to stand the test of time, or of calculating time itself by the movement of lights in our sky. 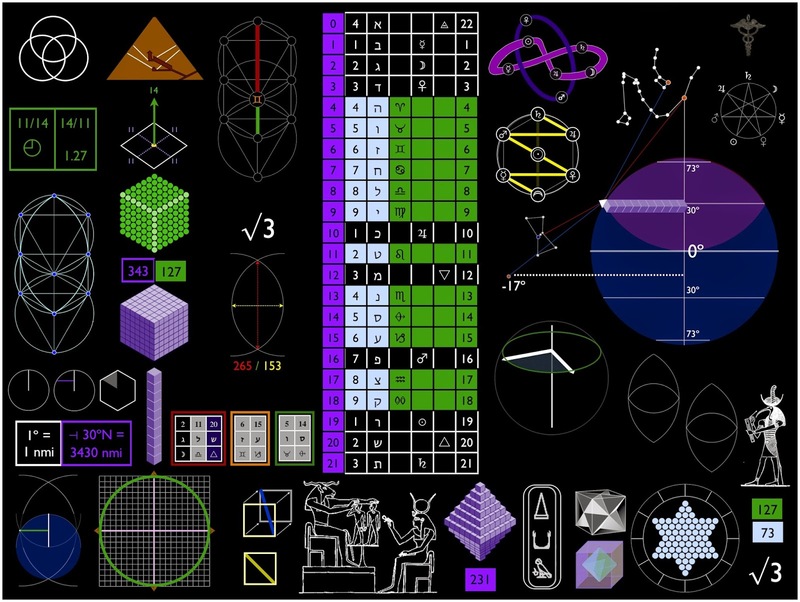 I could go on, as I have before, attempting to illustrate how the numbers obtained by matching the 3 matrice, 7 double, and 12 simple letters of the 22 letter Hebrew/Phoenician alphabet elaborate upon this scheme, but you may peruse these forums at your leisure to sample such V.I.T.R.I.O.L. Just approach it with more of a sense of humor and pun than with the otherwise traditional rigors of academic historians. At least if you wish to open the Eye. One last thing, though it may prove too obscure for your palette, are the Borromean Rings. Should you choose to take this path upon the Fool’s journey, consider how the recursive properties of the puzzle engendered by the union of Tarot and Qabalah elicits a certain fingerprint in its intersection with our 3d-space + time. What may seem to be mere coincidence to our linear experience of life may in fact be the imprint of some ‘bigger picture’ passing through collective human awareness. Thusly, Tarot, like our parent alphabet, may just be the echo of our geometry of consciousness splat upon a lower-dimensional timeline for purposes much broader than any one point-of-view.